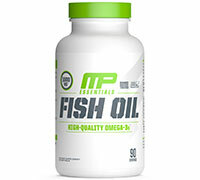 MUSCLEPHARM FISH OIL IS A HIGH-POTENCY NORDIC FISH OIL PRODUCT THAT IS HIGH IN DHA/EPA. PURIFIED NORDIC FISH OIL, BEST QUALITY IN THE WORLD! WHY TURN TO A SUPERIOR SOURCE FOR FISH OIL? Like many products, the superiority of raw ingredients is important. MusclePharm took the extra steps on our own to ensure our customers receive the best. Around the world, more relaxed testing methods increase the likelihood of impurities in various fish products. PCBs, polychlorinated biphenyls, are a by-product in the industrial development of products like engine coolants. Without strict environmental standards, more PCBs are released into the oceans and ultimately consumed by fish. We've worked hard to ensure our customers get the highest quality fish oil available with the lowest amount of impurities possible. As a biological product, fish oil breaks down over time. Freshness is key. 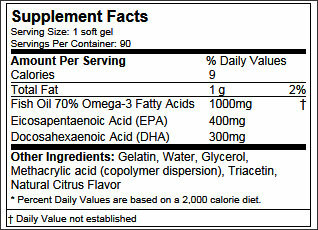 The "fishy" smell and taste in low-quality fish oils is usually the result of the maker using old raw ingredients. Besides the appetite appeal, these sources also degrade on a molecular level as time passes, which can release harmful free radicals into the end product. Along with raw ingredient superiority and freshness, MusclePharm takes extra steps to ensure our suppliers' manufacturing processes uphold a higher standard as well. Whether it's saturated fats or heavy metals, these impurities can be greatly reduced in the filtering process. COMPANY OF ATHLETES, THIS IS HOW YOU DO BUSINESS. Directions: As a dietary supplement, take one soft gel three times daily, preferably with a meal or use as directed by a physician or licensed nutritionist. ALLERGEN WARNING: This product was produced in a facility that may also process ingredients containing milk, egg, soybeans, shelfish, fish, tree nuts, and peanuts.